The installation centers around the natural forms of feathers and pine cones, both being significant symbols in Native American culture, specifically relating to the Agai-Dicutta Numu. Feathers were often used as an expression of a certain virtue or to reflect a certain individual or significant event. As such feathers were viewed in a similar manner to a gift from a high official, representing a link between the individual and divinity. The sculpture starts in the form of a feather to reflect on the link between man and divine. The bright colours painted across the platforms represent those painted across the barbs of the modern feathers used in Native American ceremonial dress and ornamentation. As burners ascend they will make their way up the vane of a feather they will complete their own initiation, drawing similarity between the great events that feathers were rewarded for in the past. As the platforms open they will begin to transform in shape to bear visual resemblance to pine cones. The pine nuts are important in particular for the Northern Paiutes to survive the winter; and have their own festival in the third week of September. The change in form will reflect the process of change from receiving a symbol from the divine, to receiving bountiful harvest and personal fulfillment. 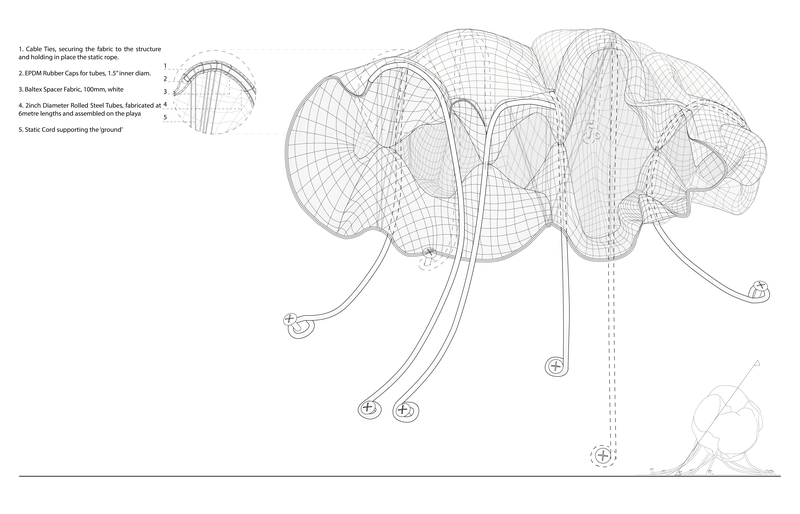 The lighting will help to accentuate the fluctuations in shape throughout the day and night, representing the omnipresent divinity and how it can be seen in many different forms of nature. 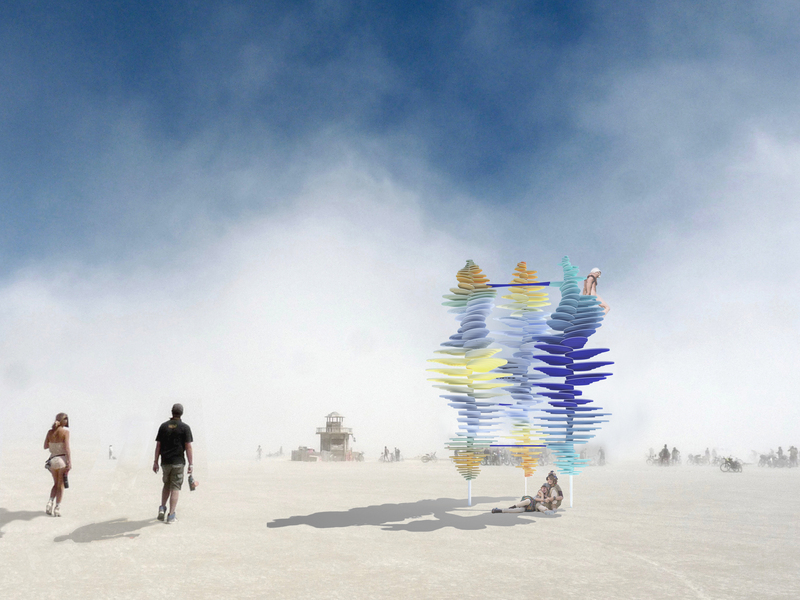 The piece will be both physically and visually interactive, with a changing form that will alter over the course of the festival. Burners can twist the colorful platforms around their central core allowing them to climb to the higher levels. As they do so they will be able to read messages of wisdom from other burners and leave their own along the way. The bridging links are fixed and thus can be used by the burners to sit and relax, observing the surrounding playa. 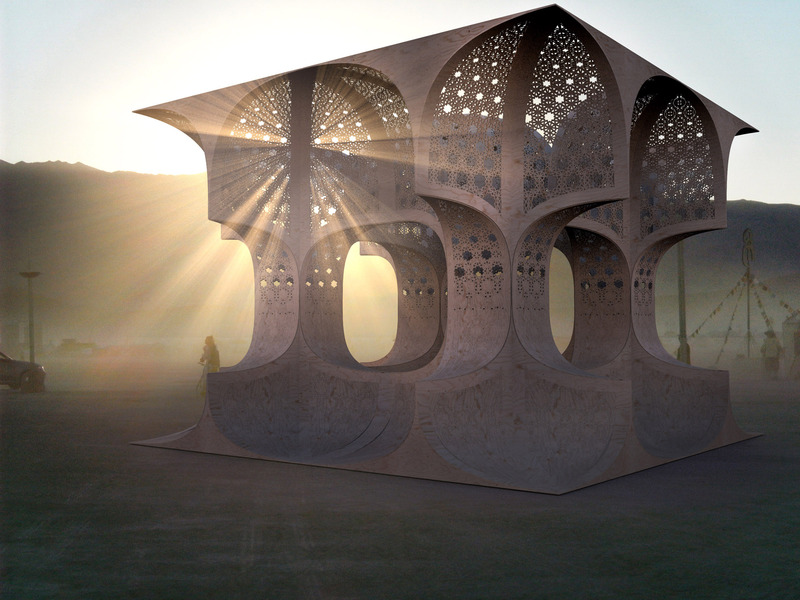 The structure can also be used as a shelter, by rotating the platforms to create shade from the sun’s direct heat as well as forming a barrier from wind. Special holes carved through some of the platforms will facilitate themselves as climbing holds to aid burners on their ascent. 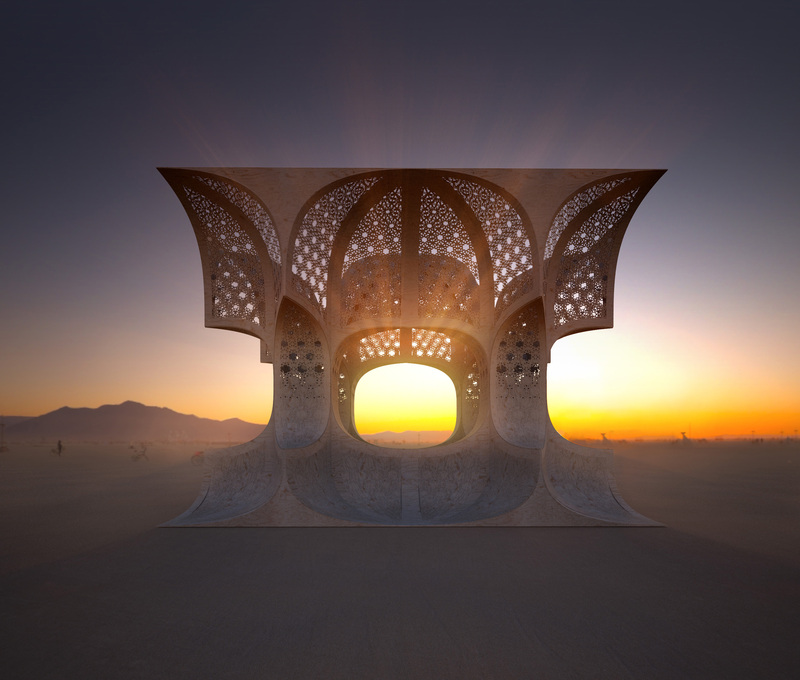 The bridging links are fixed and thus can be used by the burners to sit and relax, observing the surrounding playa. 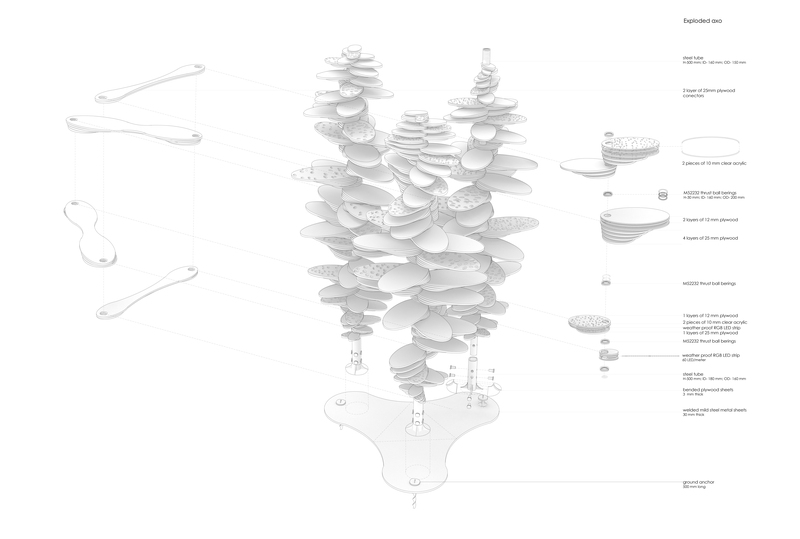 As the platforms are rotated, light will interact with the sculpture in different manners, pouring through the holes and creating intricate shadows. At night, the project will illuminate and create a light show, which will make the climbing possible even during night time. 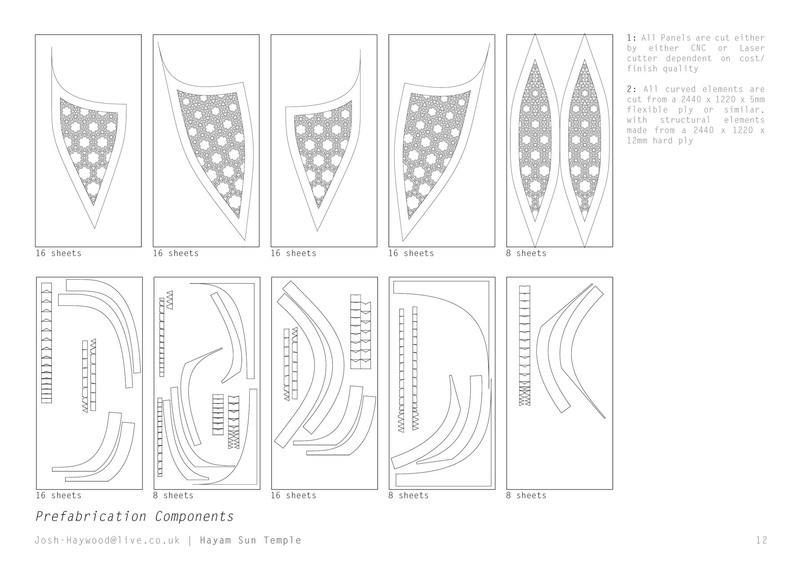 The varying thickness platforms will be comprised of 12 and 25 mm layers of plywood, depending on it’s span and form. 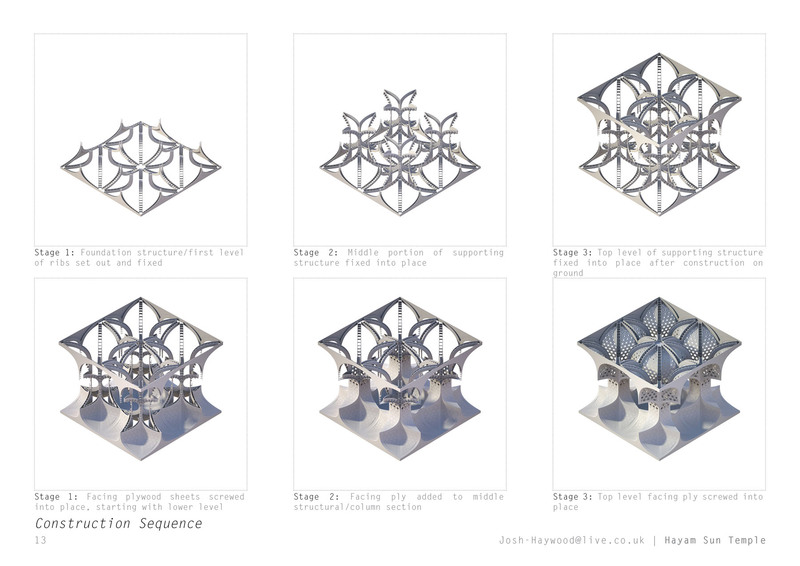 In each platform will be a ring of 10 mm acrylic between the top layers allows for LEDs to cast out a unique visual form at night. Metal ball bearings will separate each platform facilitating the change of form as it is used by burners. 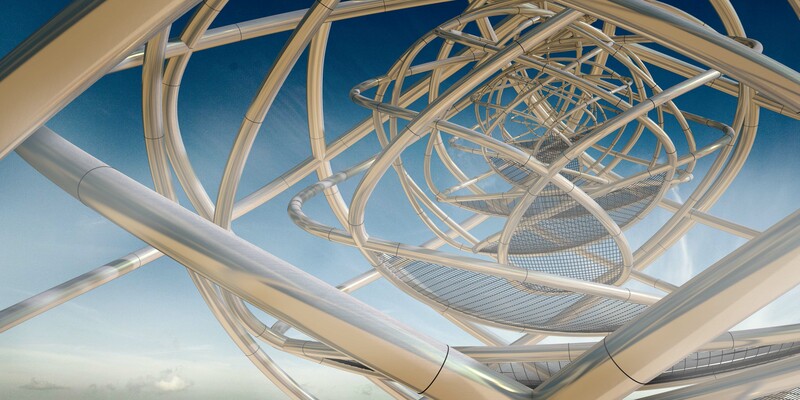 All this will be held up by steel tubes measuring between 5 and 6 meters in height with a diameter of 160mm. The steel tubes will be welded to a metal plate buried in the sand and secured with ground anchors. 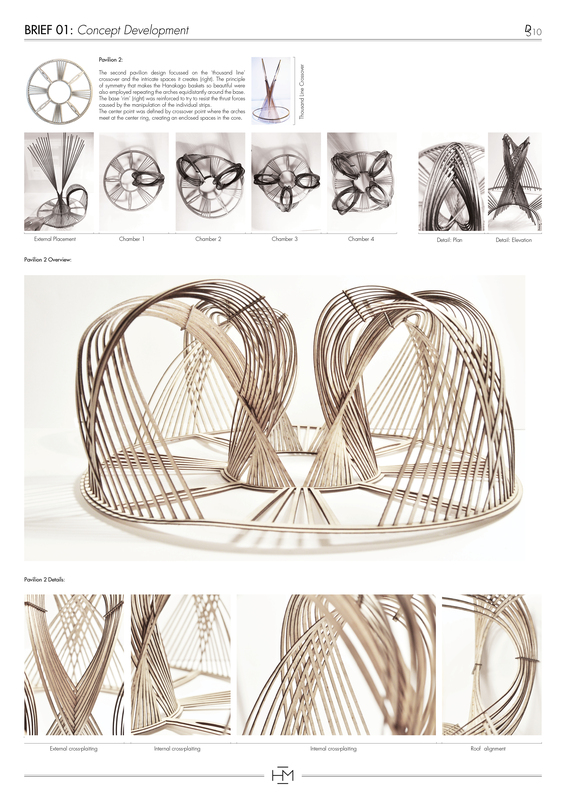 The feathers are also structurally supporting each other, through the 4 bridge link, made from the same plywood. 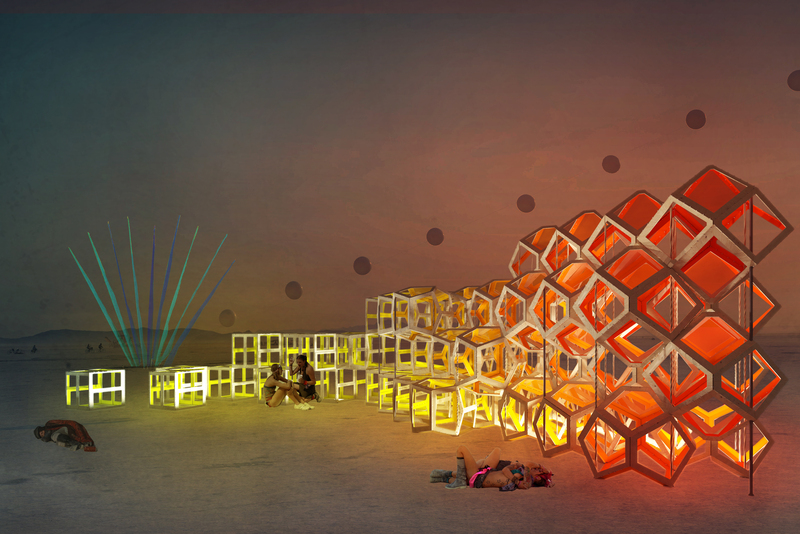 A geometric wall of fire burning on the sands of the Black Rock Desert. 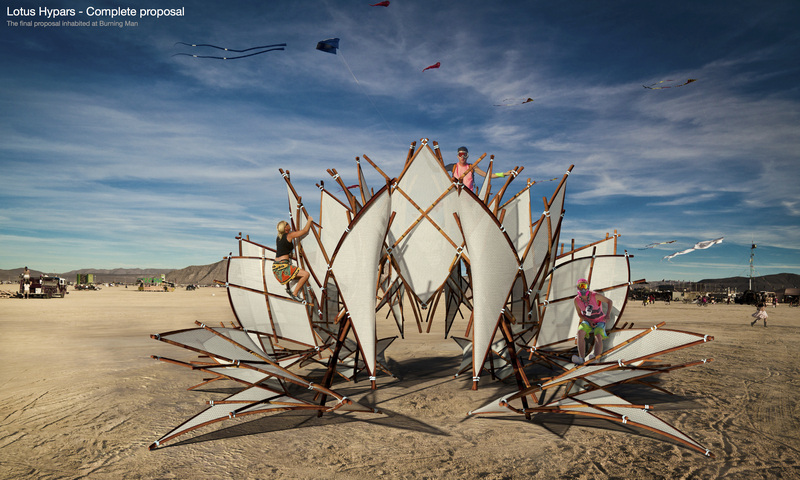 This immobile blaze stands as an edifice to Burning Man’s original figurehead. 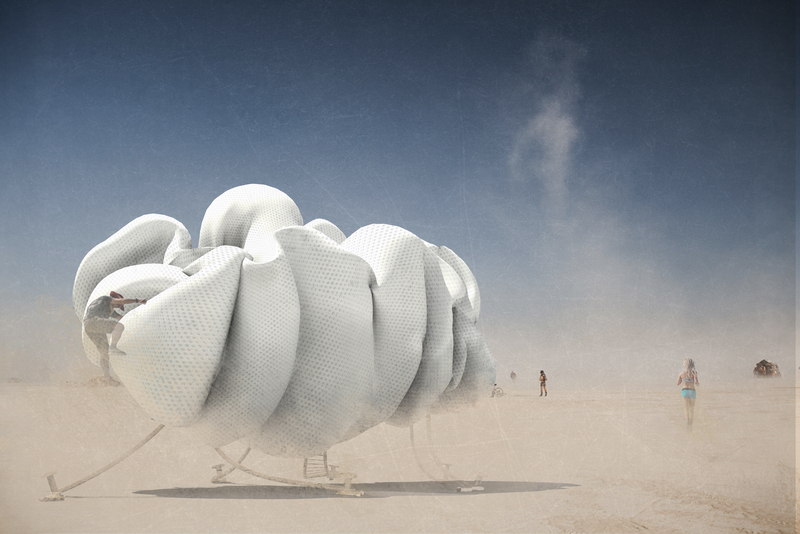 A burning yet fireless wall of plywood and acetate that can be encountered, entered and sheltered in. This sculpture stands as an abstract image of flames sent by Vulcan the Roman God of fire, an emblem of the festival’s name. 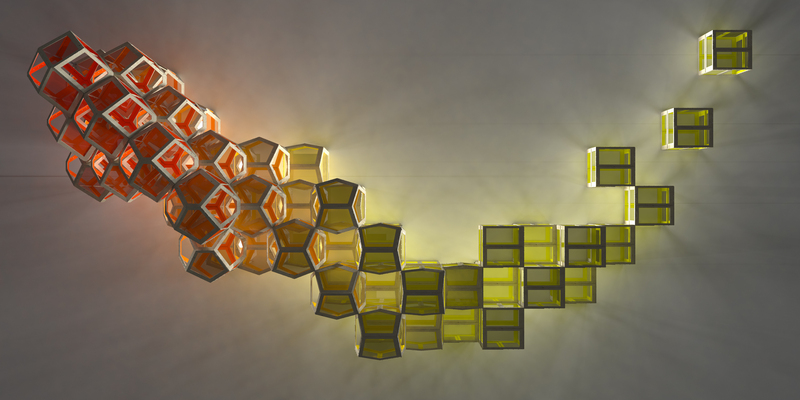 Created from a series of plywood shapes and acrylic, Vulcan’s Flame is a blazing wall of light and colour. The structure is created to both imitate and juxtapose chemical fire, sharing real fires beauty but opposing its destructive tendencies. 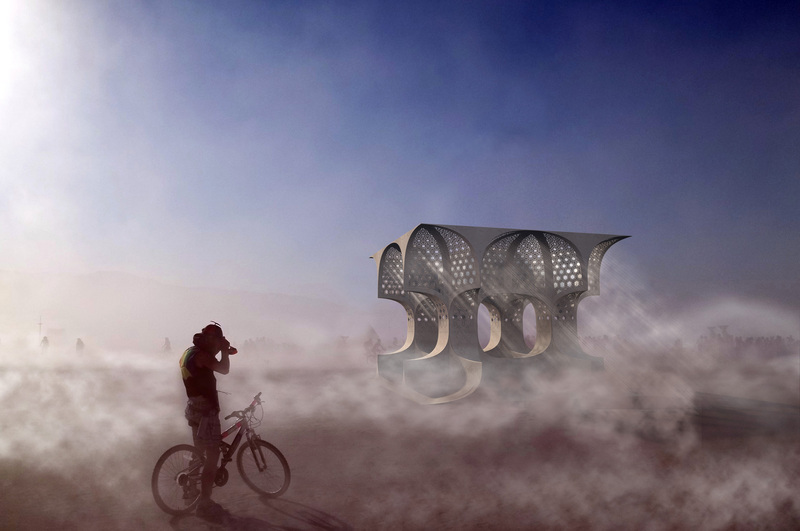 The sculpture is designed as a wall of shelter, behind which burners can be shielded from the desert’s unforgiving sun. 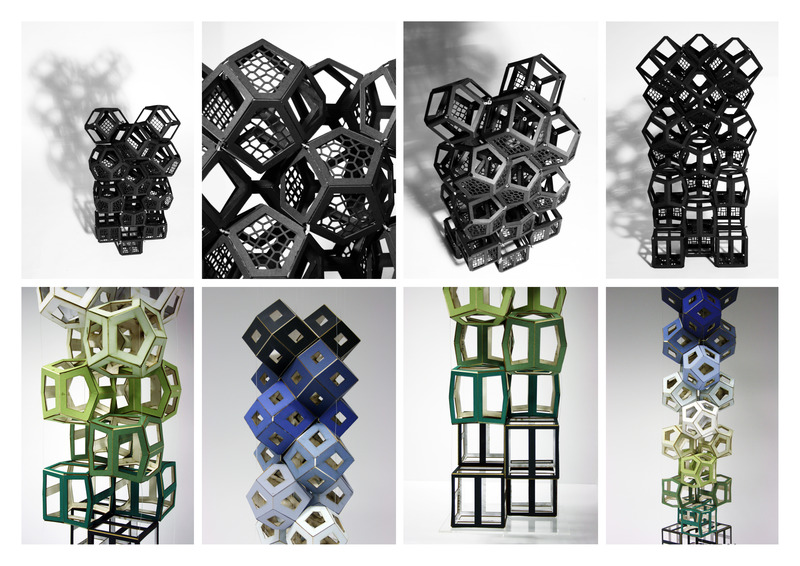 Born from Ancient Egyptian ‘Cairo tiling’, the sculpture is created from morphing polyhedra. The lowest section of the fire is created from cubes which gradually deform into rhombic dodecahedrons – a cubist interpretation of a flames movement. Internally every shape is painted to mimic fire’s bright hues and coloured acetate panels within the wall will project red and yellow tones onto the surrounding desert floor. At night internal spotlights will illuminate the entire structure, creating a glowing inferno of colour. These lights will flicker to create the illusion of movement. 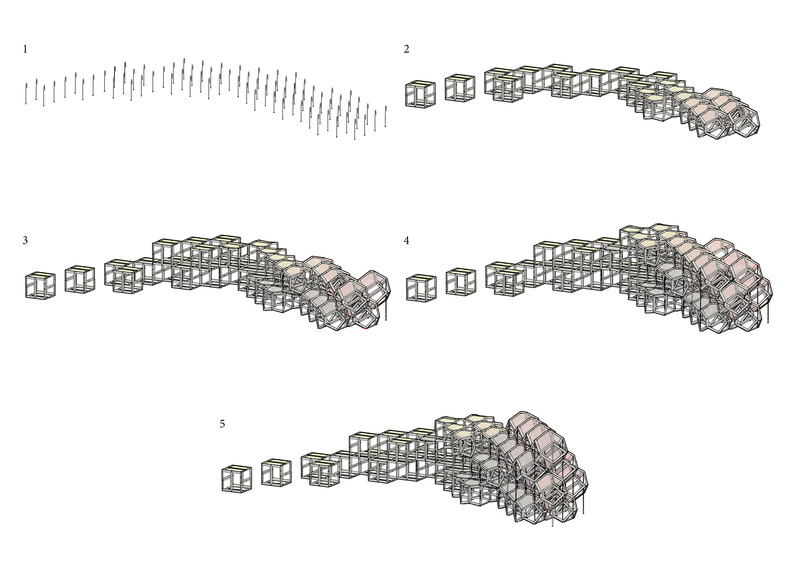 The middle zone: this is the central area in which the cubic deformation begins to occur. The inner zone: this is the coolest space, the most densely packed red area of the sculpture. 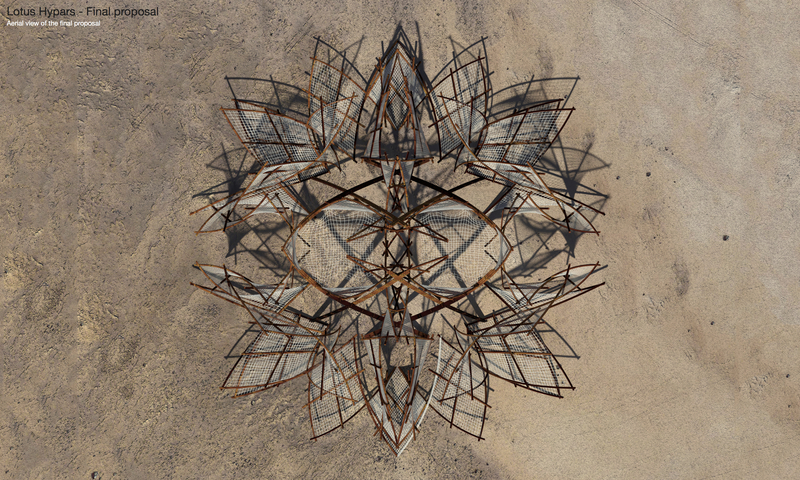 Burners can crawl into this space – sheltered by four layers of dodecahedrons. 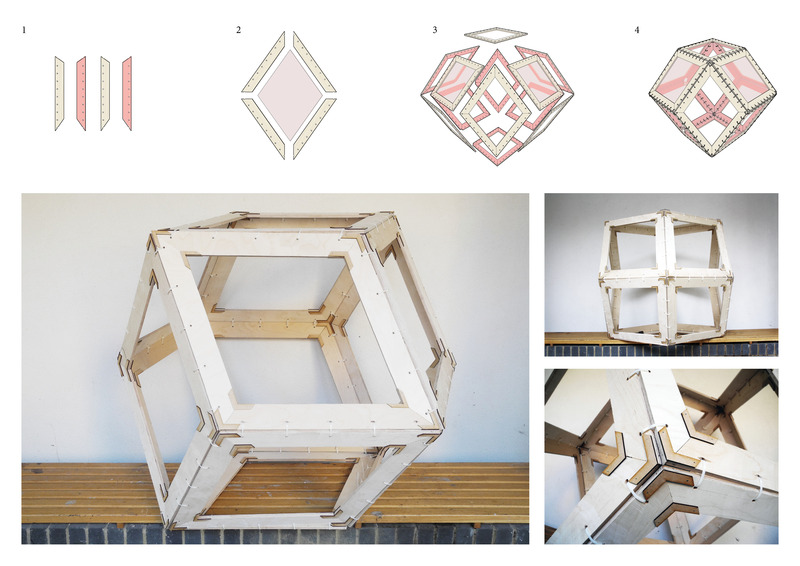 Vulcan’s Flame is a long, low plywood structure, the installation is the geometric interpretation of a flame, a curving sculpture of deforming polyhedral that slowly transform from a cube to a rhombic dodecahedron. 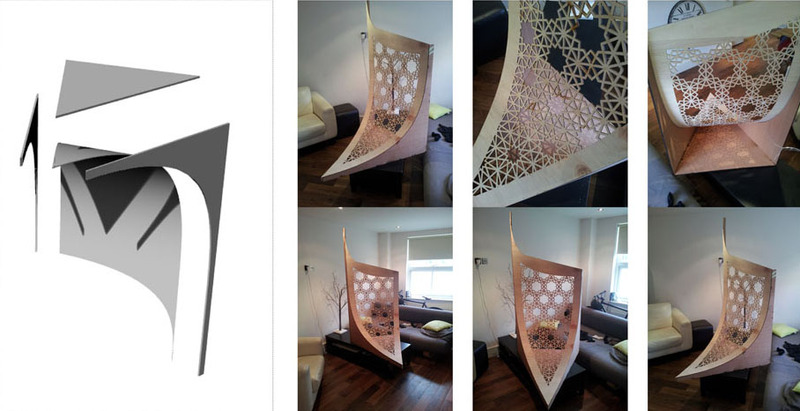 The sculpture is created from 55 plywood polyhedra constructed from hand cut plywood boards and secured with cable ties. Internally each shape is painted using natural, organic paints, as the shapes change their internal colour alters from yellow to red. 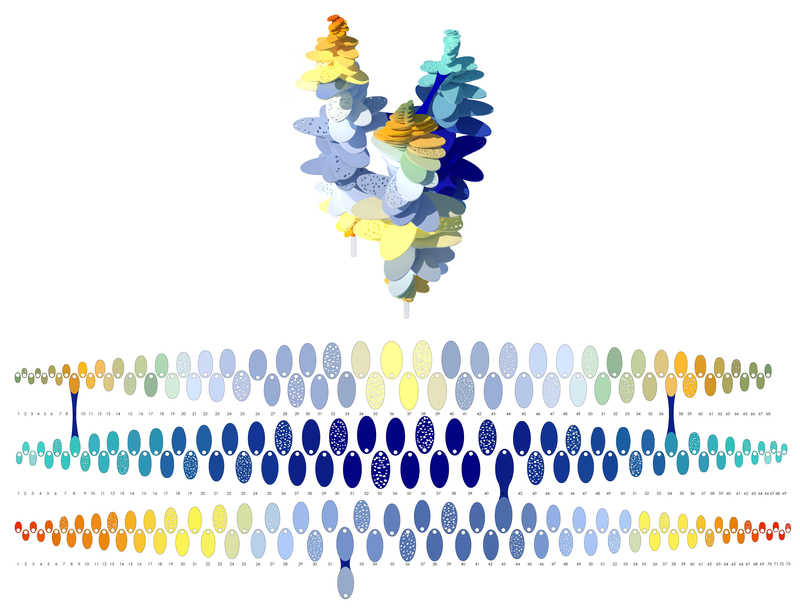 Coloured acetate panels in the uppermost faces of each shape will mirror the shapes internal hue, these panels will allow sunlight through during the day casting beautiful coloured shadows on the desert floor. At night the sculpture will be lit internally with fluctuating spot lights, this will create the illusion of flickering movement. The acetate panels will be secured with nails. 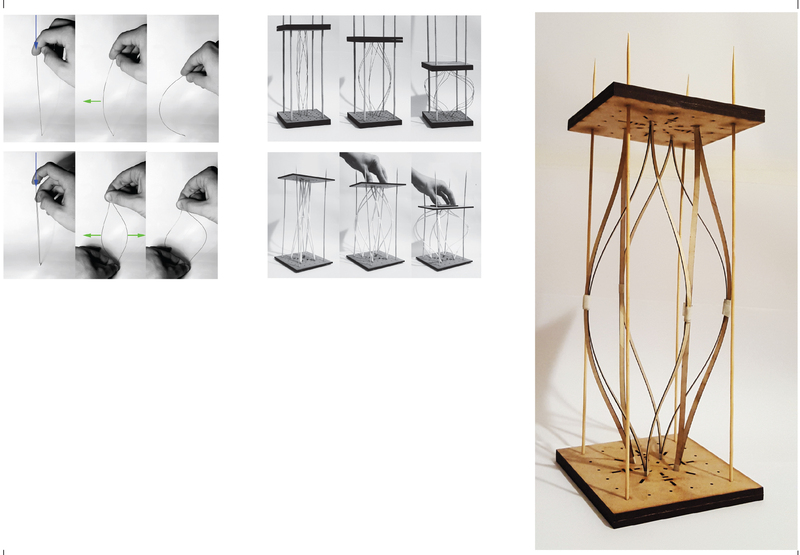 The structure sits on a base of 23 plywood shapes, secured to the ground with rebar stakes. The sculpture is very stable as the base is the widest section, the rest of the sculpture tapers away towards the top. 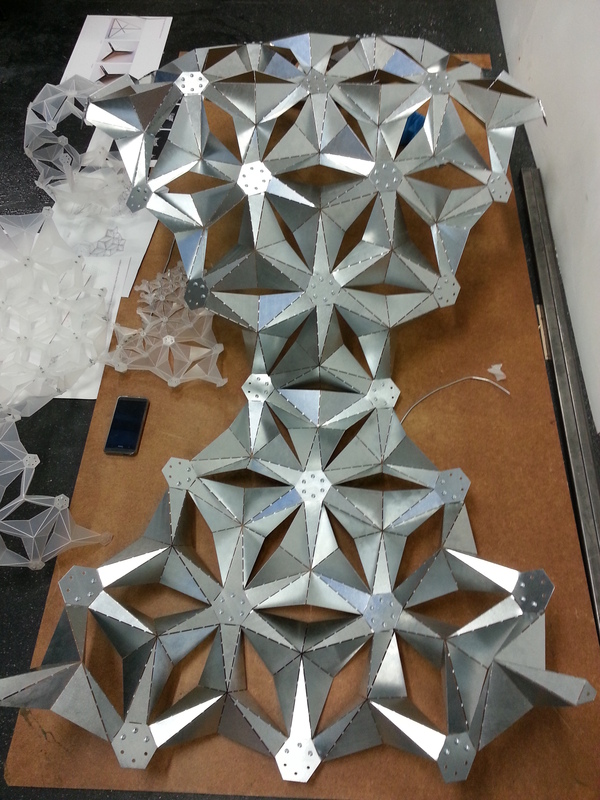 Each new shape rest on the 4 corners of the shapes below, bolted through the vertices and then secured with rope. The final and highest rhombic dodecahedron is stabilised with a steel column. 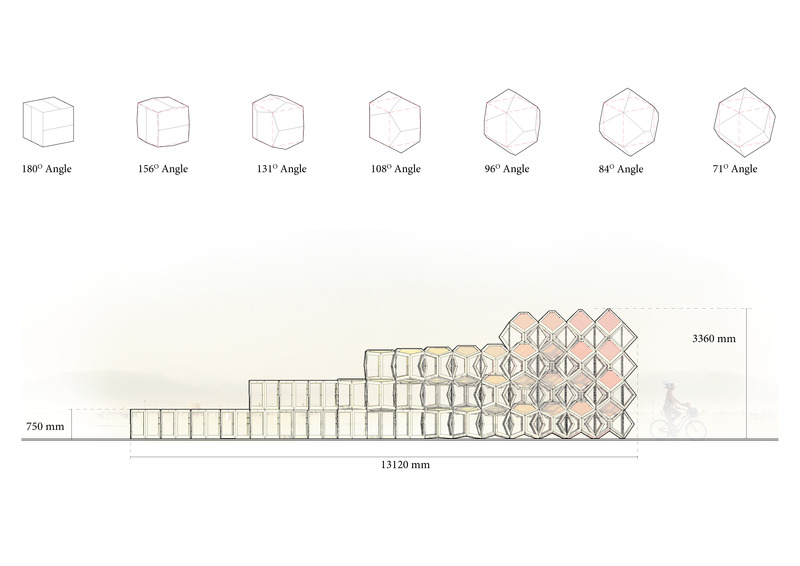 The highest point on the entire structure is just over 11 feet above ground level and consists of 4 stacked shapes. 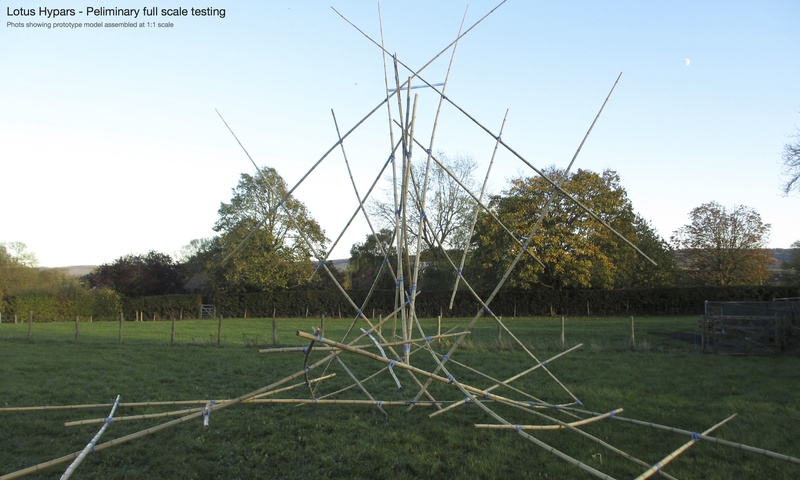 A full sized version of one of the shapes has already been constructed and load tested confirming that it can support human weight, all of the cable ties securing the structure will be meticulously rubbed down to ensure they are not sharp. 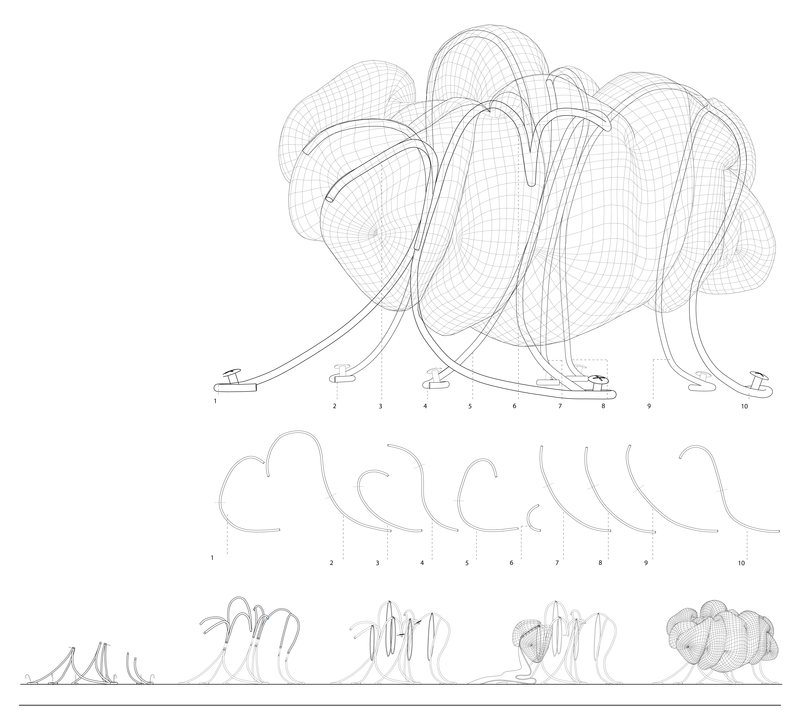 The sculpture curves in a gentle arc – creating a central area of shelter from the wind and sun. At ground level Burners can crawl inside the structure and rest in it’s shady, tinted interior. 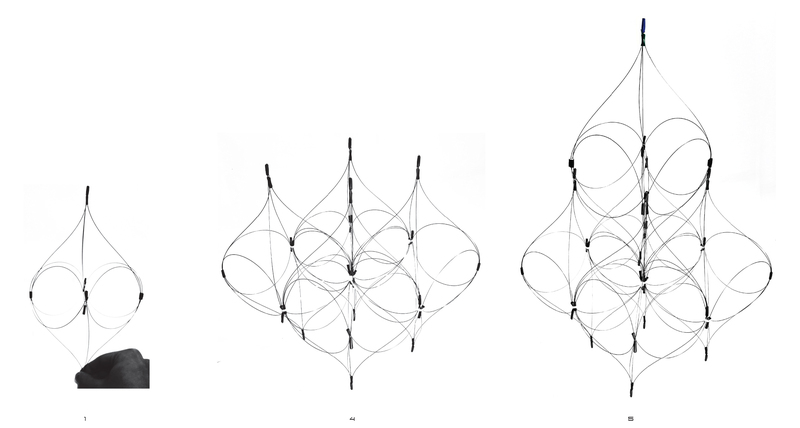 Inspired by previous research of pyritohedrons, these structures are an addition to a series of other models based on polyhedral deformation. 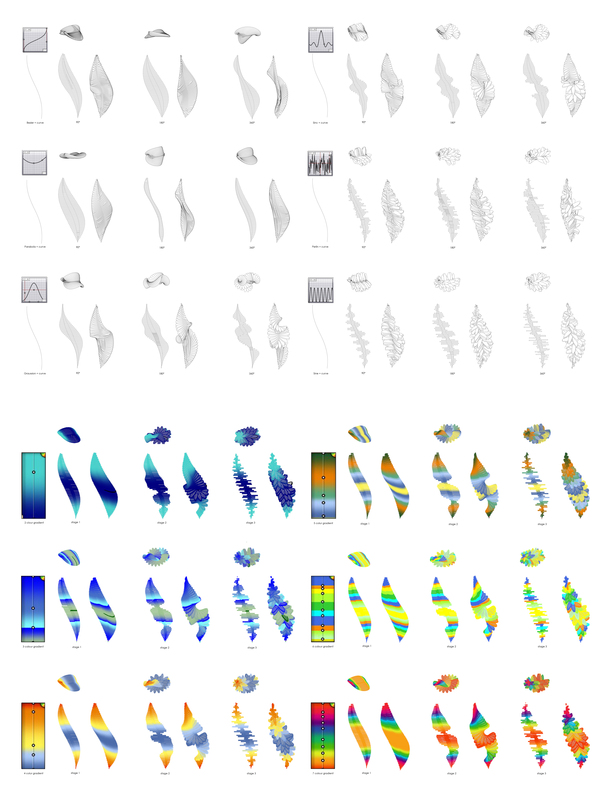 Previous models have experimented with density, altering colour and infill panels. The Lotus Hypars symbolise the “Caravansary” trading centre. 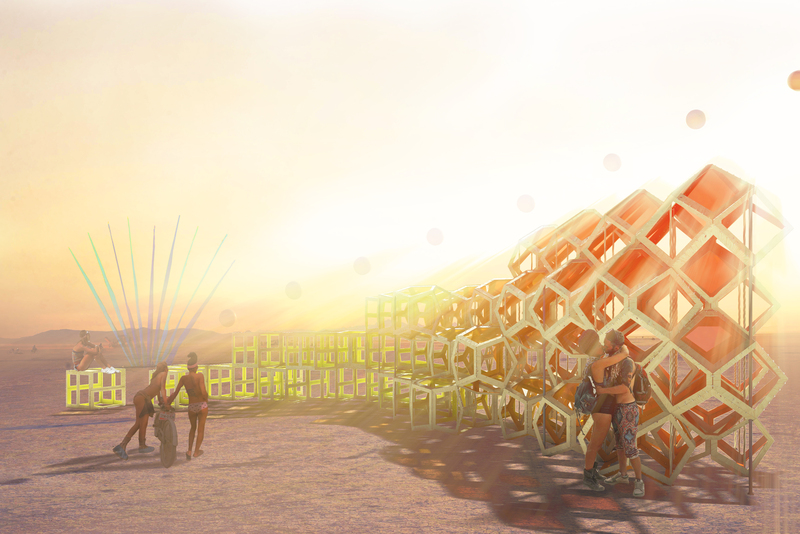 The structure is assembled as the centre for exchange after journeying across land and water to a resting point, Burning Man. Hammocks offer a space for the festivals unique style of trading to be discussed and carried out. The tangible nature of the Lotus also creates a playfulness in an otherwise formal system of resources exchange. 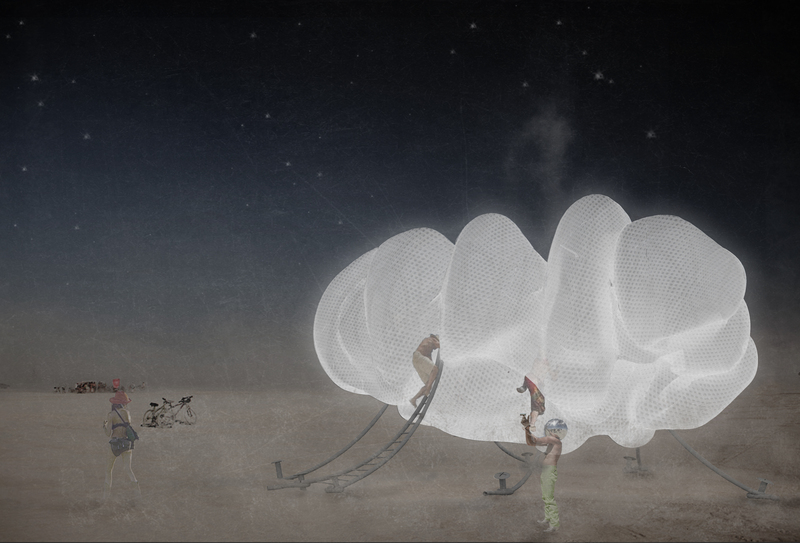 The lightweight structure evolves from the horizontal lines of the desert and forms a hyperbolic shelter. 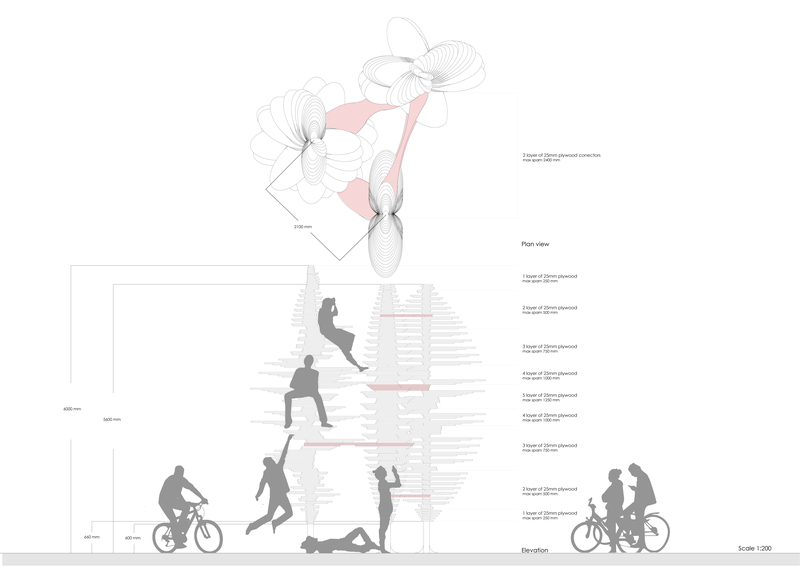 The user can inhabit not only underneath the structure, but also the petal shaped hammocks. Here, individuals can exchange stories, supplies and treasures. In Buddhism, the Lotus flower is symbolic of fortune. It grows in muddy water, and it is this environment that gives forth the flower’s first and most literal meaning: rising and blooming above the murk to achieve enlightenment. The Lotus Hypar story has evolved from the same principles. In the harsh desert environment, man can create beauty. 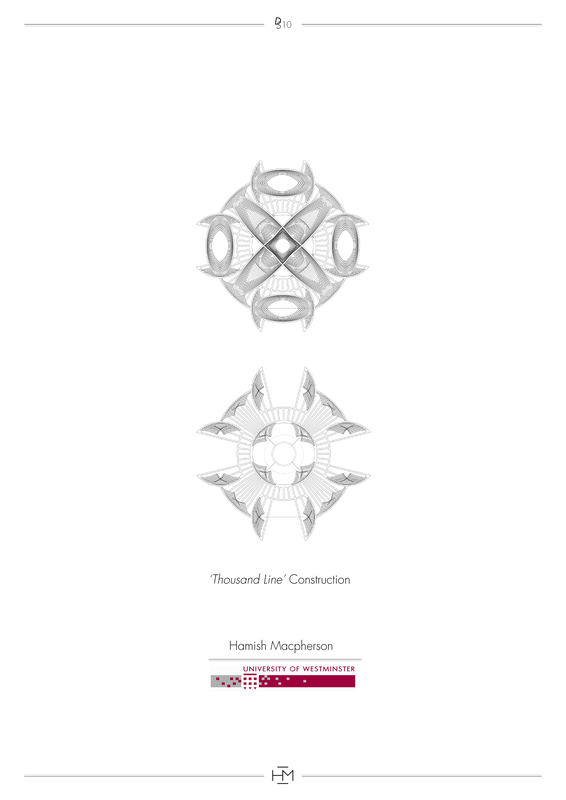 The folded geometries are playfully excited by human participation. A twist, a fold and a push. 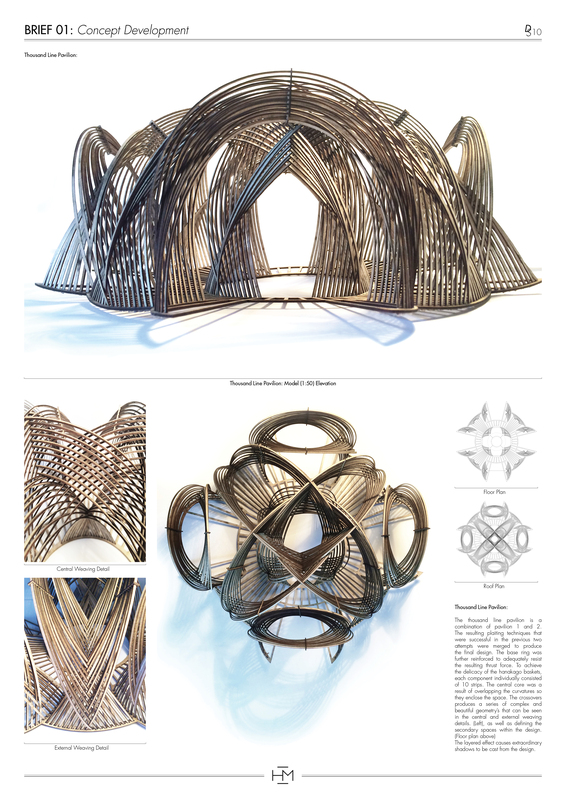 The structure is assembled using bamboo sticks that are arranged in a reciprocal formation. These canes are then bound using high strength elastic bands. 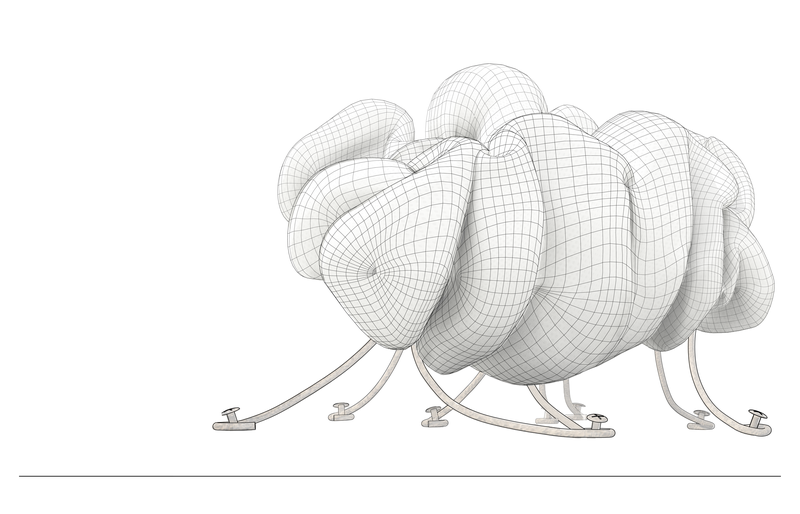 This allows for the flat cells to twist and take on new shapes. 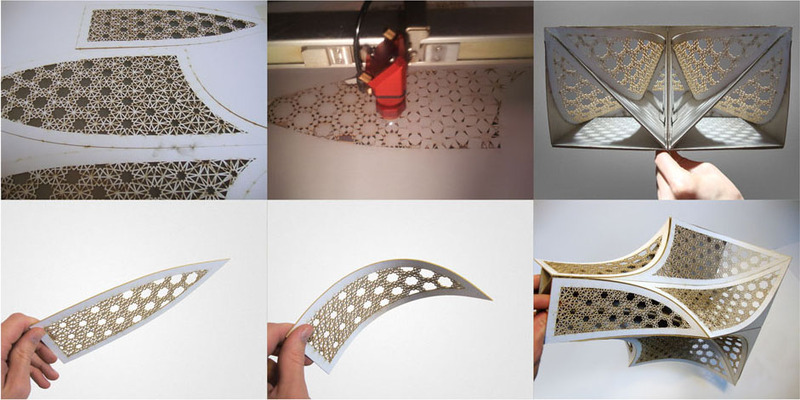 The Lotus Hypar is formed by a repetitive series of folds and the result forms petals. These are symbolic of the Lotus flower. 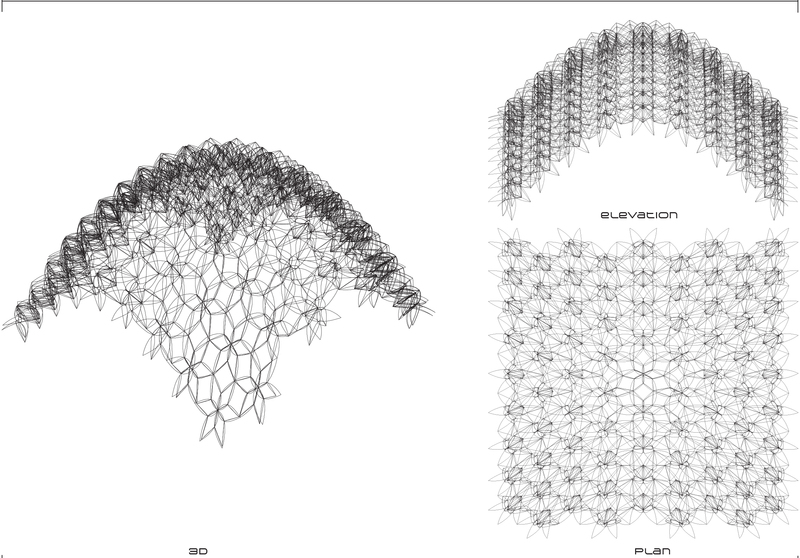 The cells are covered with a white semi-elastic membrane that adds to the strength of the structure and the petal geometries become more visible. 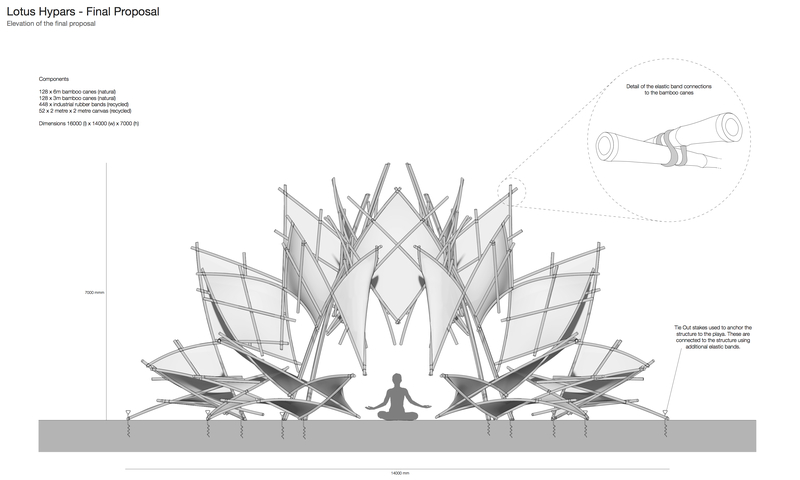 These are also the hammocks that can be inhabited by the Burning Man users. 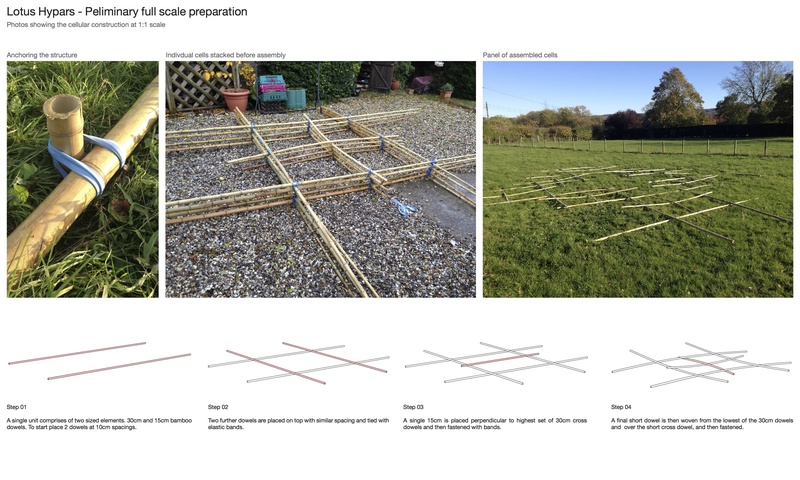 In order to test the structural performance of the proposal, I constructed a series of 1:1 scale models. 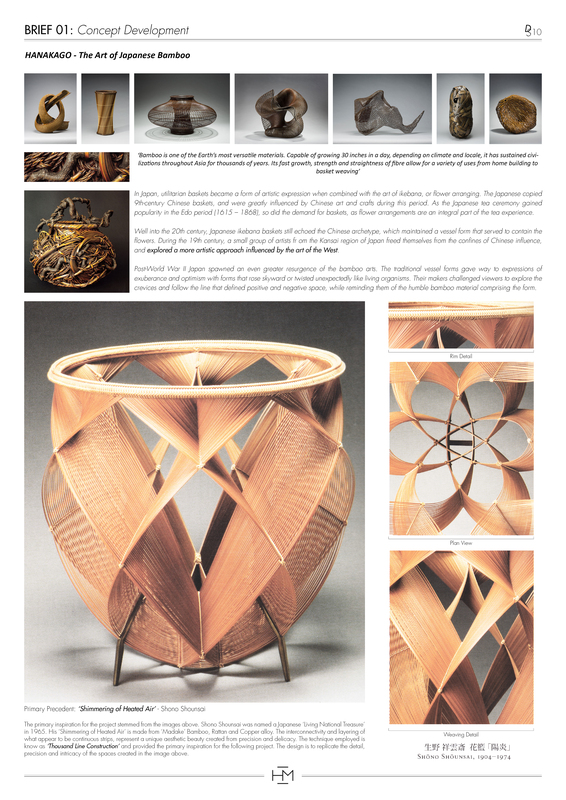 This was done using 6m and 3m bamboo canes (35mm diameter). By testing a small segment of the full proposal, it is easier to determine the success of the final proposal.